BOOKS - Don't Snooze on Clues! Teaching kids a new and safe way to speak out about dangerous activities around them. An estimated 15-20% of children are bullied in schools are too afraid to tell an adult, an estimated 800,000 kids are reported missing every year in the U.S. and weapons are slowly making their way into schools. I think we can agree that kids are faced with new situations daily. YOUR CHILD'S SAFETY IS WHAT MATTERS MOST!! Don’t Snooze on Clues! 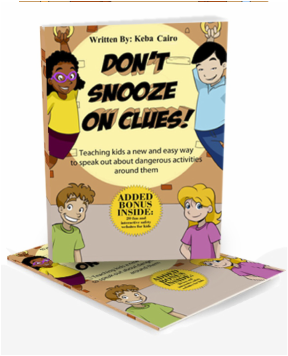 is an award nominated, easy-to-understand, and fun book that empowers children between the ages of 5 to 10 years old to proactively communicate dangerous situations happening around them. Don’t Snooze on Clues! is a great resource for parents, teachers, and librarians to introduce important topics to young children in a non-threatening, practical, and fun way. DOWNLOAD our fun filled activity book which is packed with word search, cross-word puzzle, word match and more. After completing the package, we left a Neighborhood Detective achievement certificate at the end for you.